Those who have spent even just a short time in St. Mary's County in Southern Maryland would have heard of, if not tasted, the classic traditional stuffed ham. 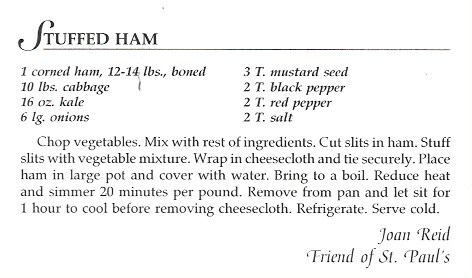 What is the Stuffed Ham Recipe? The recipe starts with a corned (brined) ham. A corned ham is cured in salt but not smoked like a regular ham. 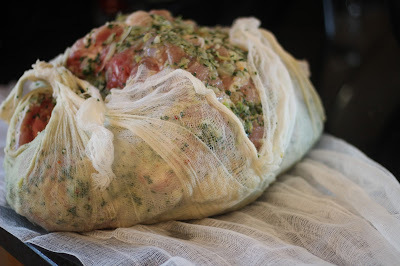 The bone is removed and then it is stuffed with a mixture of many things including cabbage, kale, onions (wild onions could have been used historically), mustard seed, celery seed, crushed red pepper, and black pepper. Note that folklore states that people in northern St. Mary's County use more kale than cabbage but the people in the southern portion of the county tend to use more cabbage than kale. 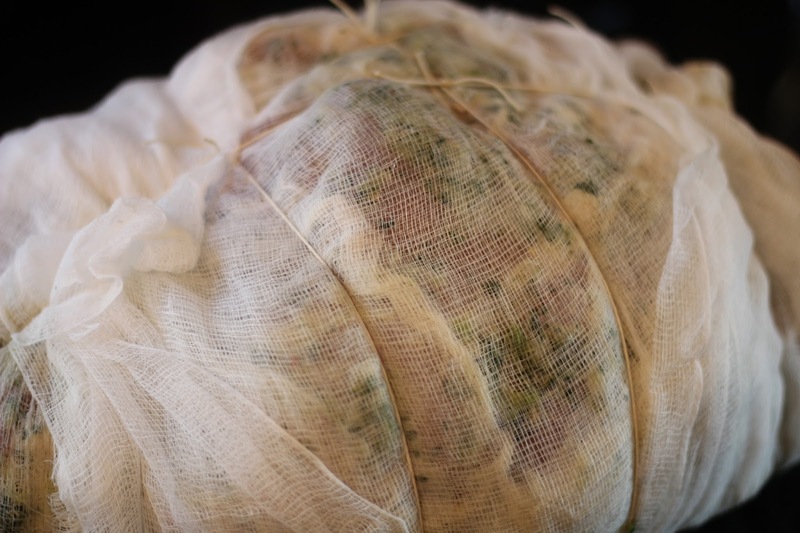 The ham is then wrapped in cheesecloth and boiled. Usually, the ham is served cold. 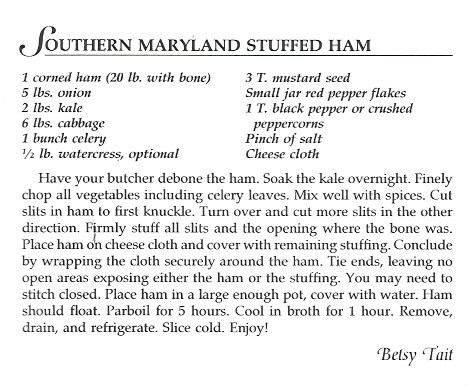 What is the History of the Maryland Stuffed Ham? 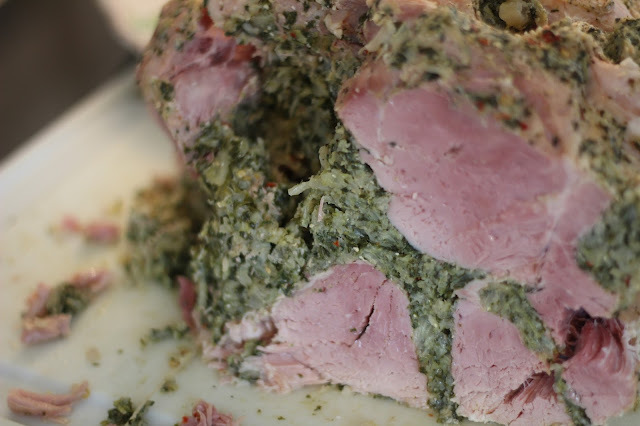 The Stuffed Ham is one of those dishes that goes back so many generations that its precise origins are lost. It is a recipe that has largely been passed down through oral tradition; no pre-modern written recipes exist. Medieval European Origins: Stuffing meat goes way back in time –just not usually stuffed ham. Although the Lincolnshire Stuffed Chine from England is very similar to this American stuffed ham. The dish uses the chine, a cured pork neck/backbone, and it is stuffed with simmered or steamed parsley and sometimes other herbs such as lettuce leaves, young nettles, thyme, marjoram, sage and blackcurrant leaves. You can read more about it at Slow Food in the UK. Caribbean/American Origins: According to historian Dr. Henry Miller, the use of hot spicy red peppers is not part of the traditional Anglo-American diet. Therefore . . .
Enslaved Afro-Marylanders may have introduced the peppers as they were not common practice in English cooking at that time. An old unproven theory says that a slave of Jesuits at St. Inigoes (in St. Mary’s County) invented it (possibly a slave from the Caribbean). One theory suggests that while the best parts of the hog were reserved for the slaveowners (the best hams and bacon), the slaves may have been given just the lower jaw of the pig (the jowl) and they stuffed pockets in these jowls or jam bones. Another theory suggests slaves may have stuffed hams given to them at Christmas to make the meat stretch further - a practical way to extend the amount of servings of the special ham. 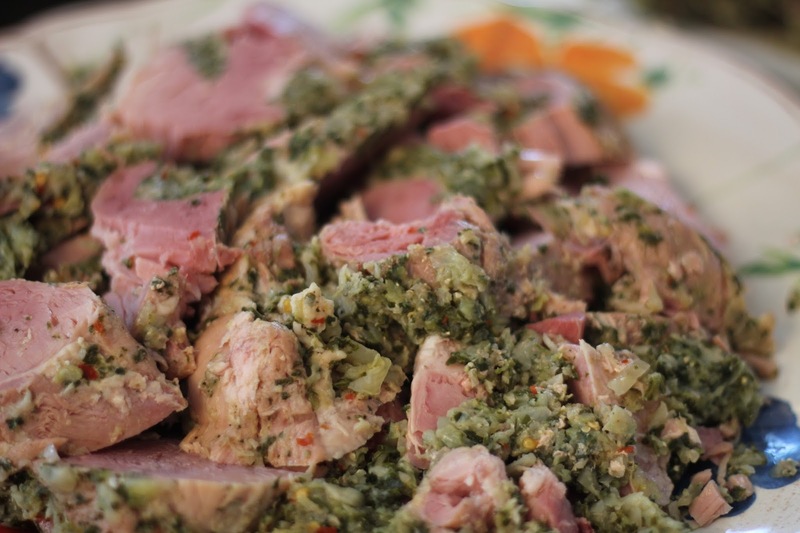 The preference for adding hot spice to hams can also be found in many recipes for curing hams in 19th century Maryland manuscript and printed recipes. Salt, saltpeter, molasses and/or brown sugar, hickory ashes, and cayenne pepper are prolific in recipes for Maryland curry hams. I have an extensive collection of cookbooks published in Maryland by Marylanders. Some were authored by professional chefs, some by professional cookbook writes and a lot (most) by religious and/or civiv organizations for fundraising purposes. In all of the dozens of cookery books I have, there are really only two that have recipes for this ham dish. "Hams of twelve pounds or more are best to use for 'stuffed ham,' a popular dish with Southern Marylanders, particularly at Easter. The ham to be used is best when less than a year old. 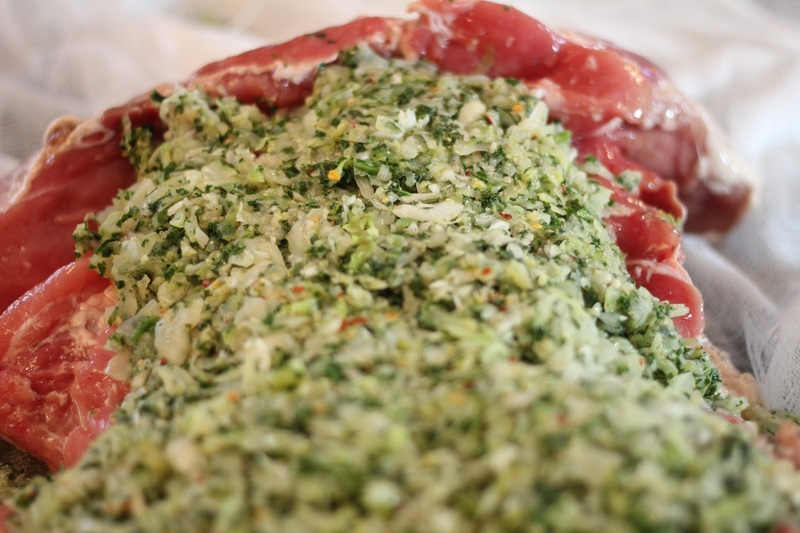 For a sixteen-pound ham use one peck of greens: cabbage sprouts, turnip greens or kale, two dozen bunches of spring onions or their equivalent in chives, red and black pepper and celery seed. Allow fifteen minutes per pound after the ham starts boiling and cook steadily until three-fourths done. Then put aside to partly cool while the greens scald in the ham liquor. When well wilted, take greens up and chop well. Season the greens with celery seed and pepper to taste. Then with a sharp knife cut crescent-shaped openings in the ham, top and bottom, as deep as the knife will go. 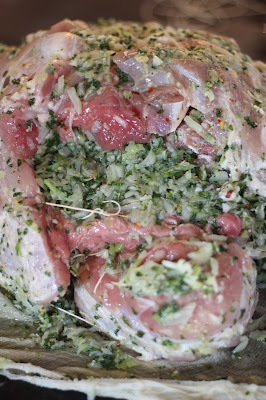 Stuff the mixture of greens in the incisions, as much as they will hold. Make as many incisions as the ham will conveniently take. Note: You will want to start this recipe about 2 days in advance of serving it. 1 De-Boned Corned Ham (18-22 pounds); In Maryland, you should be able to order one from your local PA Dutch/Amish Butcher; Keep the Bone! 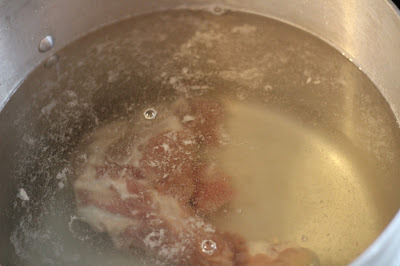 Place the ham bone in a very large (24-quart size) stock pot and cover with about 4 gallons of cold water. Place on medium-high heat and bring to a boil. As the foamy scum rises to the top, remove with a ladle. You will beed to do this about 5 times. This is important because if you do not remove the scum, a bitter taste will be imparted. 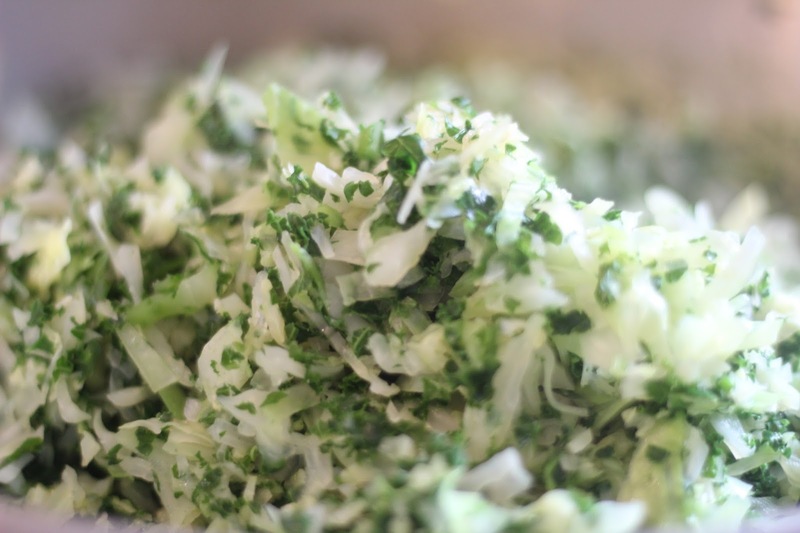 Add the prepared cabbage and kale to the water and blanch for about 15 minutes. Drain the vegetables and place in a large mixing bowl. 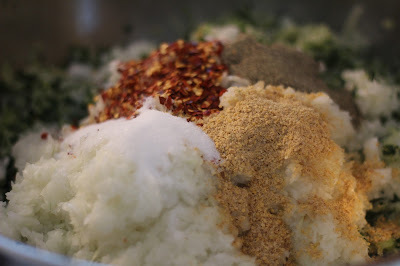 Add the onions and spices and toss together well. Allow this mixture to cool to room temperature and then cover and refrigerate overnight. Set the ham in top of the center of the cheesecloth. Stuff the cavity left from the bone first and then tie up the ham with kitchen twine. Make several 1-2 inch slits all over the ham. Insert the stuffing into the slits in the ham. When finished stuffing the ham, tie it up with string and then wrap it snuggly in the cheesecloth. You can tie it closed or sew it closed. 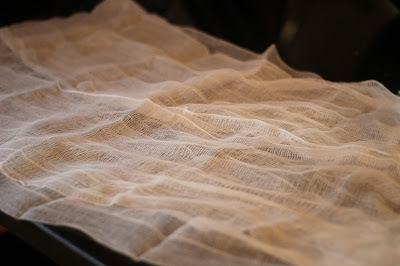 Toe up the ends of the cheesecloth like in the above picture. wrap over the top of the ham. it's been wrapped and tied. 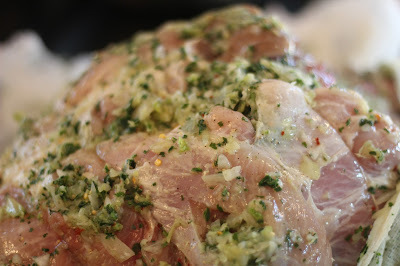 Place the wrapped, stuffed ham back into the cooking pot and bring to a boil. Reduce heat to medium-low and cook for about 5 hours (about 15 minutes per pound). Allow ham to cool off in the cooking liquid. When cool to the touch, remove the ham from the liquid and refrigerate overnight. When cold, the cheesecloth can be removed and the ham can be carved. Awesome job! Hope you liked it. It's definitely a distinct, acquired taste; I usually split a whole ham with a friend because out of 10-12 people gathered for a dinner, only a few of us will eat it. But then we have plenty of leftovers! Your recipe is very close to the one my friends and I follow each Thanksgiving when we get together for our annual ham stuffing. I'm from neighboring Charles County, but a close friend is from St. Mary's -- and it was through her that I was introduced to this delicacy. 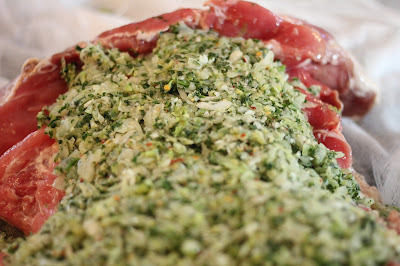 We don't cook/blanch the vegetables in advance; everything goes into the ham raw. 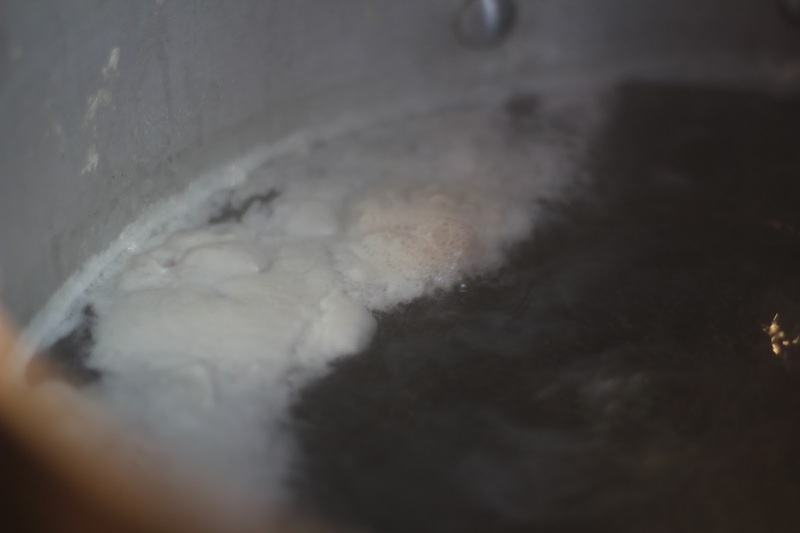 And rather than boil, we bake ours -- it takes about 6 hours in a 350-degree oven, give or take. But I know plenty of folks who boil theirs. In fact, our ham crew is evenly split -- and divided -- on the "best" manner of cooking! Really, everything just comes down to preference. My brother-in-law swears it's fantastic on white bread with mustard. And now I'm quite hungry . . .
Chocolate Almonds: An 18th c. "Eating Chocolate"